A project of the National Fertilizer Corporation Employees Cooperative Housing Society, NFC Phase II has been embroiled in controversy for quite some time now. Different parties have been fighting to take over the society’s management-related tasks. The tussle culminated in the parties bringing on court cases, which is the reason that elections for the management were delayed for a bit. Things are pretty different now, as the elections in question were held on May 21 and the elected candidates have finally taken charge of the society. With this development, the society has seen a sudden value increase of 10% to 15% and this trend is expected to continue in the coming time. 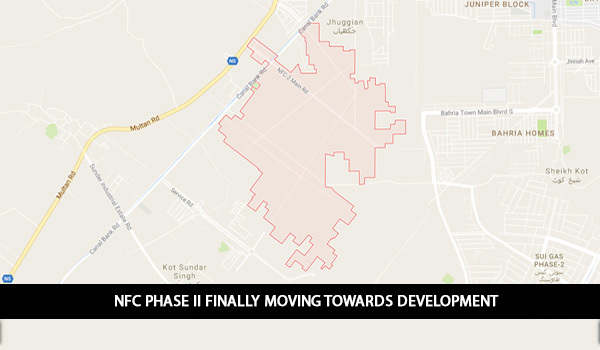 The main question now is when the management will start development work in NFC Phase II. According to the society, the management will take another month to make tenders, roll them out in newspapers, and finalise a company that will start the actual development work. Another question that should poke your mind is when will the society be completed? A society official told me that the society would be developed within a period of two years. Now comes the issues of the Lahore Ring Road (LRR), which is expected to cut through the society. The proposed LRR route will affect Block A and commercial plots located at the entrance of the society. My sources have said that the government has not yet contacted the society’s management in this regard. SL3 of LRR is yet to be finalised and the route that is to go through NFC Phase II is still unclear, according to the society official. Considering this price increase in the last few days, the prospects of the society seem bright. I would still suggest you do proper market research before finalising any deal with any seller. I also believe that this is the right time to invest in NFC Phase II, but avoid plots that may be affected by LRR. Simply put, be careful when buying plots in Block A or commercial plots located at the entrance of the society. Otherwise, the rest of the society is promising for investment. The current investors of the society should heave a sigh of relief now and hold onto their plots to bag good returns in the future. That is all I have to share about NFC Phase II for now. If you have any queries about the society in mind, you can post them in the comments section below.